This October's 2018 Asia-Pacific Traditional Arts Festival is themed around "The Preservation and Adaptation of Traditional Arts," and groups from around the world who have inherited various forms of traditional performance have been invited to Taiwan. By offering a platform to showcase these diverse art forms, the festival aims to safeguard such heritage. This year's festival will, for the first time, reach out beyond the traditional boundaries of Asia-Pacific to include groups from countries as far-flung as Japan and South Korea, from Northeast Asia; Armenia in West Asia; the North Asian Tyva Republic; and Bulgaria and Serbia in Eastern Europe. 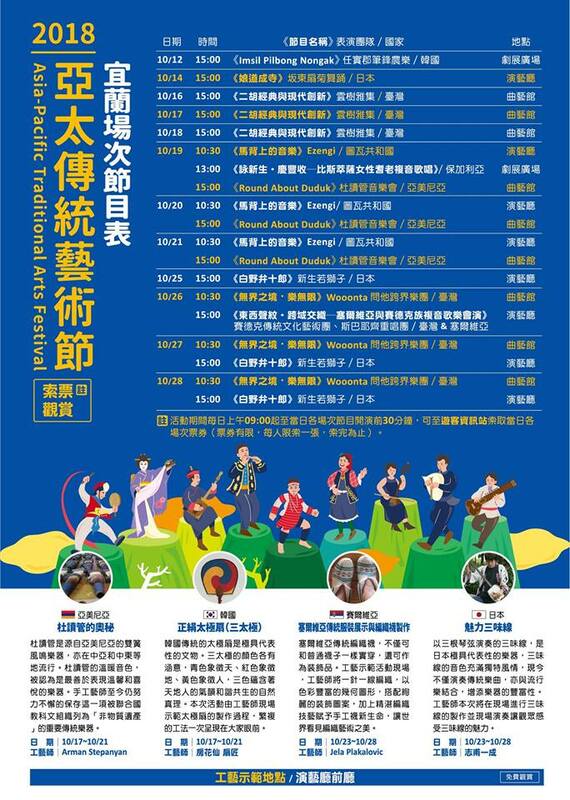 A total of 12 foreign and five Taiwanese groups are taking part in performance and exchange over the course of the month-long event. Groups making their first performance in Taiwan include Japan's New Lions Troupe, who will be performing a Japanese adaptation of "Cyano de Bergerac" titled "Shirano Benjyūrou"; South Korea's Imsil Pilbong Nongak, who will be presenting the innovative face of traditional nongak folk music; Balkanopolis, from Serbia, who will combine tradition with jazz to present moving lyrical tributes to the lives of the people of the Balkans; Bistritsa Babi, a female group from Bulgaria who will sing of the beauty of life, nature, and love; the band Ezengi from the Tyva Republic, that will stun audiences with their combination of throat singing and contemporary music; and Jivan Gasparyan Jr., who will channel the profound and evocative nature of the Armenian duduk. The premiere program includes "Ma," a performance that brings together traditional Japanese buyō dance, modern dance, and nanguan music; "Round About Duduk," a duduk quartet featuring musicians from Armenia and France; the widely well-received Bulgarian Eva Quartet; the Svetlana Spajić Group from Serbia, with their polyphonic combination of the traditional and the avant-garde; and "Dazzling Dawn: Musical Portraits of Korean Peninsula," a joint performance by the National Chinese Orchestra Taiwan with the National Gugak Center from South Korea. 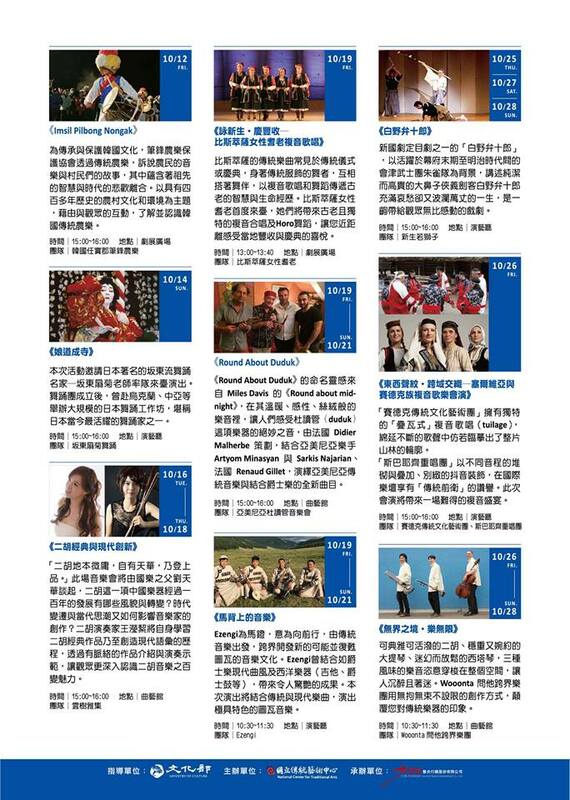 On the Taiwanese side, Woonta, winner of the Best Music Arrangement award at the 28th Golden Melody Awards for Traditional Arts and Music, will present their fusion of eastern and western music; Wang Ying-chieh, whose first album was released globally on the French L'empreinte Digitale record label, will wow audiences with her skills on the erhu; the National Chinese Orchestra Taiwan and Chio Tian Folk Drums & Arts Troupe will mix traditional Chinese music with Taiwanese tīn-thâu drumming in "The Legend of Parade Formation"; and the Seediq's Traditional Culture and Arts Troupe from Nanshanxi Tribal Village will sing the songs of their ancestors in a performance deeply interwoven with the eternal spirit of their tribal code, gaya. Established in 2000, the Asia-Pacific Traditional Arts Festival has since hosted more than a thousand local and international artists. 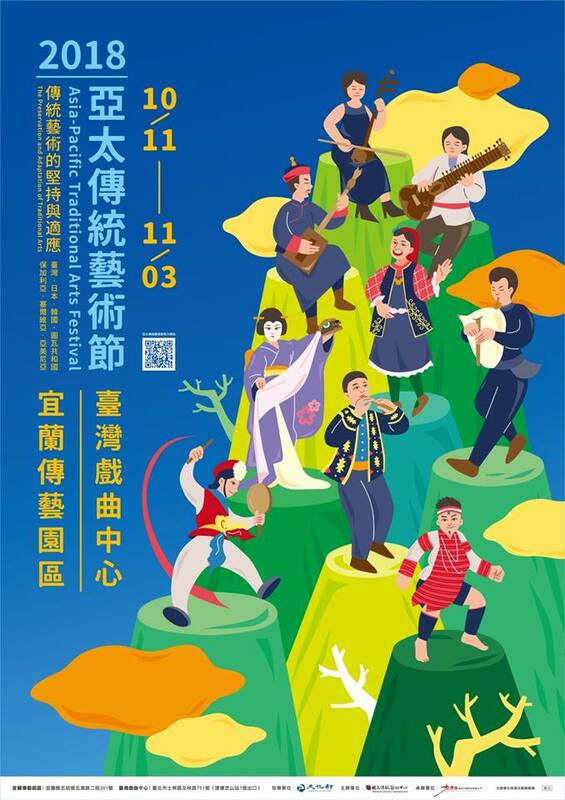 This year's festival will be held between Oct. 11 and Nov. 3 at the National Center for Traditional Arts in Yilan and the Taiwan Traditional Theatre Center in Taipei. Consisting of performances, workshops, demonstrations, forums, and more, it is sure to be a highlight of the autumn arts season. Visitors Today:93. All Time Visitors:1,229,900.